Join us tonight at the opening of Designed to Dance: Dance Ink Magazine 1989-1996, an exhibition curated by VRC staff member Debra Klein. 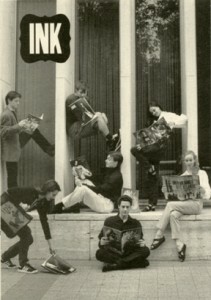 Founded by Patsy Tarr in 1989, Dance Ink Magazine was an avant-garde, quarterly journal dedicated to contemporary dance. Pairing kinetic type with dynamic photography, art director Abbot Miller accomplished the difficult task of making dance come alive in a two-dimensional medium. Dance Ink became the stage everybody wanted to be on: Duane Michals, Barbara Kruger, Adam Gopnik, Geoffrey Beene, Mark Tansey, Robert Rauschenberg and many more contributed to make Dance Ink one of the best performance and culture magazines of the 90’s. The exhibition draws from the collections of Debra Klein and Stevenson Library. Opening reception: Wednesday February 8, 7pm – 8pm, Stevenson Library Lobby.